X-Plus Gigantic Series Godzilla 1962 Vinyl Figure – $474.99 – Free Shipping! Yes, you read that right – FREE SHIPPING on this enormous, gorgeous vinyl – the best X-Plus has ever produced and Skreeonk.com’s personal favorite! Straight from his appearance in the classic 1962 film, Godzilla vs. King Kong comes this gigantic Godzilla! This massive figure stands about 19-inches tall and features a detailed sculpt and paintwork to accurately recreate his appearance from the classic film! X-Plus 30cm Yuji Sakai Godzilla 1989 w/ FREE SHIPPING! Sakai does it again with his masterful sculpt of BioGoji (1989), the suit that faced off against Biollante and sparked Godzilla’s most iconic look to date. This 30cm vinyl is a must-own for any fan of the Heisei era. Pre-Order now for only $199 w/ FREE SHIPPING and don’t pay a dime until he’s in stock! X-Plus 30cm Yuji Sakai Godzilla 1991 w/ FREE SHIPPING! Godzilla Vs King Ghidorah was released in 1991, and was the first film in Toho’s “new era” of films to feature a kaiju from the previous era – King Ghidorah. Godzilla’s evolution continues in this film, as the King of the Monsters continues to get bigger, bulkier, and more powerful. This 12-inch scale figure captures the massive size and intricate detailing of the Godzilla suit from the film. Pre-Order NOW for $199 w/ FREE SHIPPING! You Don’t pay a dime until he’s in stock! X-Plus 30cm Yuji Sakai Godzilla GMK 2001 w/ FREE SHIPPING! Here’s your second chance to own Sakai’s masterful GMK Goji sculpt from his X-Plus 30cm line! $229 w/ FREE SHIPPING! Don’t pay a dime until he’s in stock! X-Plus Gigantic Series Burning Godzilla 1995 – Bluefin Reissue w/ FREE SHIPPING! Bluefin is bringing G-Fans another chance to grab the coveted X-Plus Gigantic Series Burning Godzilla 1995. Let the ultimate DesuGoji collectible be yours for a really fair price! Pre-Order now for $449! You don’t pay a dime until it’s in stock! FREE SHIPPING when it is! X-Plus RIC-Boy Miclas (Micuras / Miculas) 25cm w/ Free Shipping! Up for grabs is the famous Ultra Seven Tiki-Kaiju Miclas as made by the incomparable X-Plus. This is the Ric exclusive version only sold on the Ric-Boy site, and comes with extra parts so he can be posed with his mouth open & exposing his trademark three snaggleteeth. KFM SPECIAL PRICE: $300 Shipped in the US! X-Plus 30cm Godzilla 2004 GFW Final Wars Vinyl Figure – $149.99 w/ FREE SHIPPING! Godzilla: Final Wars was produced to coincide with Godzilla’s 50th Anniversary, featuring almost every Toho kaiju and a number of actors from previous Godzilla films. This Godzilla 2004 Final Wars Version 12-Inch Vinyl Figure captures the film’s design for Toho’s biggest star! Pre-Order now and don’t pay a dime until he’s in stock! $149.99 w/ FREE SHIPPING! X-Plus 30cm Godzilla 1999 (2000) Vinyl Figure – $149.99 w/ FREE SHIPPING! With the turn of a new century nearing, Toho Studios once again rebooted the Godzilla series with 1999’s Godzilla 2000: Millennium, directed by Takao Okawara and written by Hiroshi Kashiwabara and Wataru Mimura. In the film, this re-designed Godzilla faces the kaiju known as Orga. Hailed by many fans as one of the more popular designs for the King Kaiju, this version features a pronounced, toothy snout and massive, pointy dorsal spines. 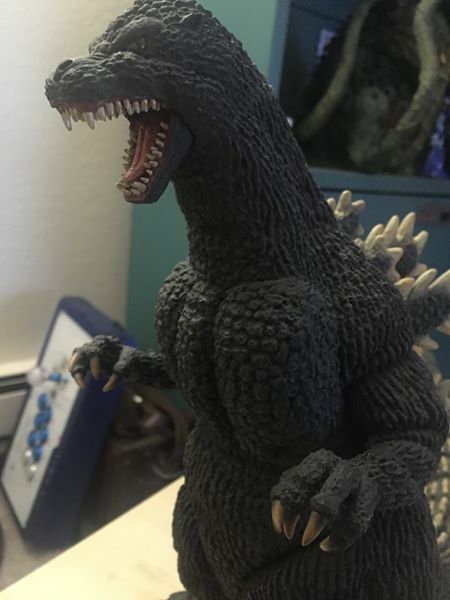 This Godzilla 1999 2K Millennium Version 12-Inch Vinyl Figure perfectly captures the “force of nature” that Godzilla has become. X-Plus 30cm Godzilla 1992 (vs Mothra) Vinyl Figure – $169.99 w/ FREE SHIPPING! In 1992, one of Toho’s most popular kaiju, Mothra, returned for Godzilla vs. Mothra! This Godzilla 1992 Battle For Earth Version 12-Inch Vinyl Figure captures the development of Godzilla’s size and mass. Pre-Order now and don’t pay a dime until he’s in stock! $169.99 w/ FREE SHIPPING!